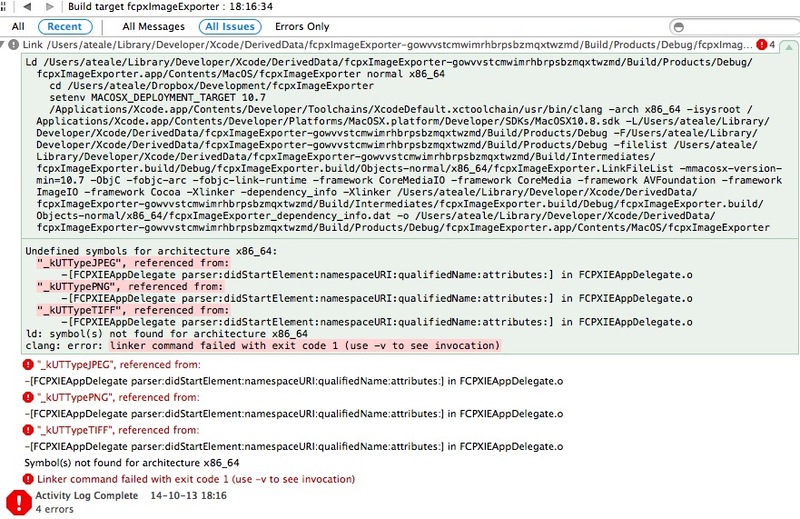 I am developing in Xcode 5 on Mac OS X 10.8. To deploy an app that will run in 10.7 I assume I need the 10.7 SDK. Is that a matter of downloading xcode 4.3 from the Mac Dev Center? So I assume it is because of this missing SDK? In Xcode go to your target > Build Phases. In "Link Binary with Libraries" add ImageIO.framework. Then go to product > clean and try to build again. Worked it out - i needed to are the CoreServices Framework. Cool!